Seersucker suits for men: Exceptional Outfit for every mens Wardrobe:-- Are you working in a hot climate or if you want lightweight men's suits for spring and summer climate, then "seersucker suits" are one of the best fashionable option. There's no necessity to wear hot, itchy suits during humid weather when you can have a seersucker suit that keeps you cool and stylish. The name itself reveals the expression for milk and honey which comes from Persian language. It is a thin all-cotton fabric, wrinkled, striped and even checkered which is used mainly for making summer suits. It is woven in such a way that some bunched threads altogether forms the wrinkles and provides some crushed irregular appearances. This is the thing that makes the fabric to be held always away from your skin even at very stingy situations and provides free ventilation. One of the best advantages is that the pressing is not necessary. Mostly very light shades are the standard colors but some basic shades are also comes in this fabric. This fabric production is a unique and very slow process. So, some major companies alone involved in seersucker fabrication because of its slow fabrication process and also for its high production cost. History of Seersucker: During the British rule in India, one of the popular clothing worn by the laborers and workers are seersucker which made them to feel the high breathability and the chillness meanwhile performing their work. It was then imported to America in the 2nd half of the 19th century and initially they're worn by men who're in the railroad and high humid oil industries; and mostly worn by the poor people around there. Heavy duty fabrics were also made available for making the Laborers overalls, working jackets and hardened caps. Because of its durable and ventilated nature, seersuckers were mostly prized by men who're working in hot engines and furnace industries. Later the next few decades, the seersucker suit had great popularity between college men of the Northeast and males of all categories in the boiling South. Journalists from these areas also practiced to wear them when they're about to hide at the seashore areas; Nowadays seersucker suits are the most favorite summer fabric were most men love to have in their wardrobe. But even with this extreme popularity, only the blue collar men alone accepted it but both upper and middle class people literally rejected. Later they're continued to be the most common summer suit. Shades and Lines: Wider lines are appropriate to wear during the formal as well as traditional categories and the thinner lines look too stylish and modern. Blue and white are the normal colors that are very helpful in making you to stand out in the crowd. Next to that olive green proliferates the place of blue which looks trendier. 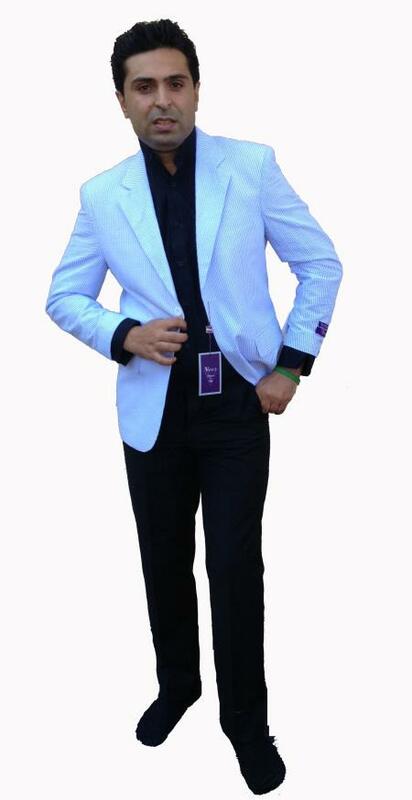 Size: For wearing a more appropriate suit you must have the suit that fit to your specifications as well, and it is more important to have the best fitting seersucker suit as it makes you to look like wearing pajamas. Make sure to have your seersucker suit altered to your required size. It is better to go with unpadded natural shoulders which make the exact fit you need. Inner linings: Mostly seersucker suit comes with lack of linings which provides the free ventilation and the linings may compromise its natural features. It is not like other fabrics, its creases are okay but it needs to be ironed as well. When to Wear: There's a major issue in this seersucker suit, you're not suppose to wear this for all events or occasions. It is necessary for you to recognize when and where this seersucker can be worn without any disturbances. Avoid using this suit during your office timings. This suit is suitable for the casual gatherings along with your colleagues. Wearing them at casual events would be a good idea and it can be helpful for you to make a perfect sense among the guests who came to the party. Majorly this will help you to stand out from the crowd. When you mix it with a snow white shirt then it would be appropriate for all occasions. Particularly it can be perfect when attending the wedding anniversaries taking place during the months of may and even at August. You must know the shades whether it is opt for casual or other official events. These may not be suitable for dinner parties where the professional outfits are likely to be insisted. Accessories: When you're wearing a seersucker suit it is mandatory to wear a right accessory for better performance. In that category most important thing is a pair of shoes; you need to think about it when you are accompanying with your suit. Mostly the saddle shoes are good looking with this suit type. You may also go for black or brown loafers as it boost your style, look and personality. If you're trying to make a different look in seersucker suit, then add a pair of black shoes with a matching belt. Better to avoid using the sandals, as it ruins the entire style statement. Another accessory is belt, which shouldn't be compromised for any reason. It is must to select the color of your belt as same as that of the shoes you wear. You have another option to overcome the usage of belts, i.e. Suspenders. Make sure to wear an appropriate color that suits exactly. 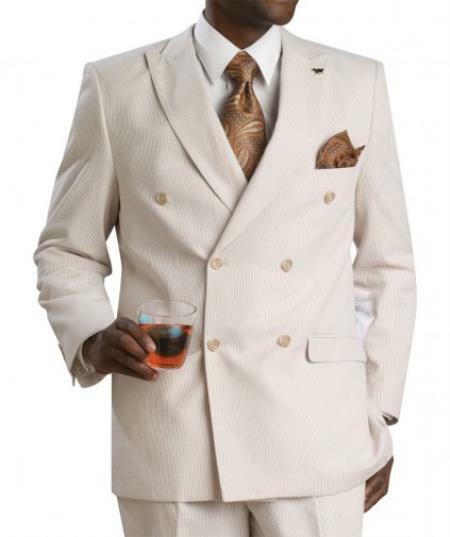 With a perfect selection of the suit, your outlook can be made mesmerized by every-one at the crowd and even more with our huge collections of seersucker suits at MensUSA. We at MensUSA providing vast range of designs, sizes, patterns in our portfolio for your convenient purchasing. You can surf through our site and select the suit that fits you perfectly with some appropriate accessories.